Self-decribed showman and blogger-annointed dessert whiz Charles Phoenix made headlines for creating the Cherpumple, a sweet take on the turducken consisting of a cherry pie, a pumpkin pie and an apple pie baked into a cake. Now he's one-upped himself with a Six-Layer Milk-Soaked Cereal Cake with Frosted Flakes Frosting. 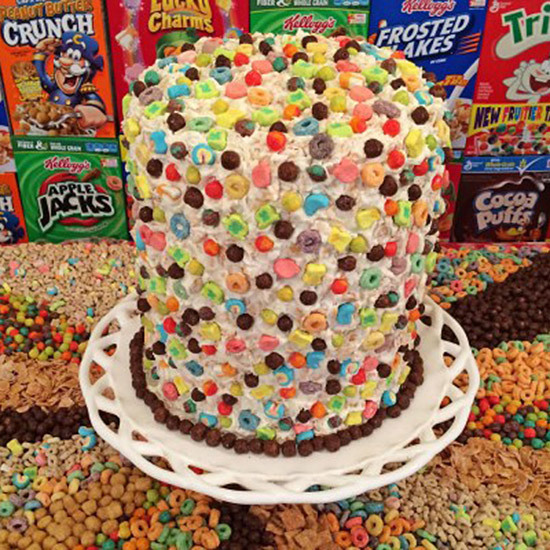 Here are the layers: Apple Jacks with spice cake, Trix with blue velvet cake, Cinnamon Toast Crunch with yellow cake, Peanut Butter Crunch with chocolate cake, Froot Loops with red cake and Cocoa Puffs with white cake. It’s a towering work of sugary brilliance. What to drink with it? Cereal milk, of course, which is a natural byproduct of the recipe. He's even provided a recipe.